In the Sundargarh district there is famous steel plant named Rourkella, which also has the beautiful Indira Gandhi Park with a zoo. 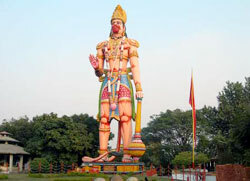 The attraction of the place is the Hanuman Batika, which is in the center of the city. There is a picnic spot in Vedavyas on the confluences of two rivers. Manbdira, which is situatee nearby rourkella, is a dam, offers boating facilities. Junagarh has a fort of historical and archaeological importance with ancient caves. Another haunt of the tourists is the Mirig Khog Waterfalls, a picnic spot. The 244 meters High Khandadhar is the loveliest waterfall in Orissa, it offers a delightful refreshing sight of Orissa. This entry was posted in Orissa, Raurkela. Bookmark the permalink.